Last week we talked about autoimmune hypothyroidism (called Hashimoto’s) and this week we’ll be discussing autoimmune hyperthyroidism (called Graves’ disease). There are certain conditions that I absolutely want to shout from the rooftops about and share the solutions that naturopathic medicine has to offer for them. This is not only because the solutions are so effective but because the conventional solutions are unappealing. Graves’ disease is one such condition! Graves’ disease is an autoimmune condition which causes a hyperthyroid state. For typical hyperthyroid symptoms and some basics about the thyroid, read the first blog in this series: The Basics. Graves’ disease can be life-threatening if it is left untreated. Because of this, conventional medicine’s approach is to act quickly and definitively to stop the process. This is often done first with anti-thyroid drugs and beta-blockers (which slow down the fast heart rate that occurs in Graves’). Next they either kill the thyroid tissue with radioactive iodine taken orally or remove the tissue surgically. While I agree that action needs to be taken quickly, naturopathic medicine does offer other solutions. Why aren’t the conventional solutions ideal? First off, none of the solutions really treat Graves’ as an autoimmune disease. Instead of addressing an aberrant immune system, they focus on the thyroid. The thyroid is simply the mistaken target of the immune system in Graves’ disease. It isn’t actually the problem. From my mindset as a Naturopathic Doctor, this is simply treating a symptom and not the underlying cause of Graves’ disease. I often use an analogy from Dr. Mark Hyman, an MD who practices functional medicine, which is a fire and its smoke as the underlying problem and the smoke detector beeping as the resulting symptoms in our body. In the case of Graves’ disease, the thyroid is just the smoke detector, not the fire itself. When one takes thyroid medications or destroys the thyroid, the underlying reason that the thyroid is not functioning properly is ignored. This is likened to taking the batteries out of the smoke detector; there’s still a problem in the body and therefore there’s still a fire burning. Admittedly, it isn’t always easy or straightforward to discover the true root cause of a person’s thyroid symptoms, or where and why a fire is burning. Every person is unique and so are the myriad of reasons why we develop diseases, including those involving the thyroid. It is also common to develop hypothyroidism while on thionamides. The second step most conventional doctors take is using radioactive iodine and surgery which will cause permanent hypothyroidism; patients will then be reliant on thyroid medication for the rest of their lives. In addition to this, the thyroid is super-important in helping the body adjust to the conditions of our internal and external environment. Because it’s involved with every cell of the body, the thyroid is constantly adjusting and responding to keep things balanced. Synthetic thyroid gives a static dose and you may lose the flexibility to respond to the environment around you. To put it mildly… that can be uncomfortable. I highly encourage those diagnosed with Graves’ to seek out real alternatives. #1 – My first recommendations for those diagnosed with Graves’ disease is find a qualified alternative practitioner experienced in autoimmune conditions, preferably Graves’ in particular, to work with. I would suggest that practitioner be a Naturopathic Doctor (like me!) or functional MD. Unlike Hashimoto’s, which isn’t life threatening and tends to create more smoldering issues compared to Graves’ rapid attack, this is not a condition where you can start on your own with diet modifications and internet research. While some aspects of health are, and should be, do-it-yourself projects, this is not one of them. In this situation, it’s necessary to be aggressive to prevent some of the more severe symptoms of Graves’ and to prevent permanent damage. 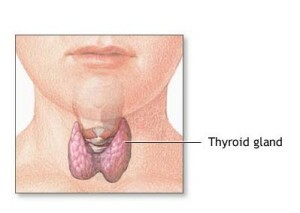 The hyperthyroid state caused by Graves’ disease can lead to neurological issues like behavioral and personality changes, psychosis, agitation, tremors, and seizures. It can also impact the heart by causing palpitations, chest pain, atrial fibrillation (a problem with heart rhythm) and, rarely, heart failure. This is not by any means a way to scare you into choosing an extreme option for dealing with Graves’ disease but to encourage you to be responsible and get the proper guidance you need from an expert. #2 – My second recommendation is to also establish a relationship with an endocrinologist that you feel comfortable with and who will support you in seeking complementary care. I don’t strongly recommend a relationship with an endocrinologist for my patients with Hashimoto’s but I do for those with Graves’. And although I do see rapid improvement in patients after starting my initial treatment plan for them, it can be very helpful to have the option of low-dose anti-thyroid medications during the first 1-3 months of treatment. This allows patients to feel more comfortable and sleep better so that they can be more successful with the treatment plans I craft for them. I also like patients to be well-informed about what the conventional medical alternatives for treatment are and to also be familiar with the consequences of letting Graves’ go completely untreated. #3 – My third recommendation is to make sure that the approach you take is multifaceted and tailored to YOU. I like to establish a strong framework for the work we’ll be doing by using an anti-inflammatory autoimmune Paleo diet, incorporating daily Foundational Habits that support your overall balance and detoxification, and a few key supplements to balance your immune system. From there, it usually gets very individualized, as with every patient I see and condition I treat. Often deeper detoxification is helpful to remove toxins that might be confusing your immune system into creating autoantibodies to your thyroid. Exploring sources of stress and how you deal with it is crucial for us to address as well. 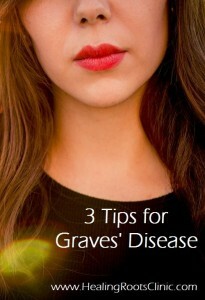 It is important to remember that Graves’ is first and foremost an autoimmune condition, not a thyroid condition, and that it should be treated as such. The conventional thinking is that once a person has an autoimmune condition, they are more likely to develop more. This is because the immune aspect of the disease is rarely addressed in a way that allows it to reset and heal. 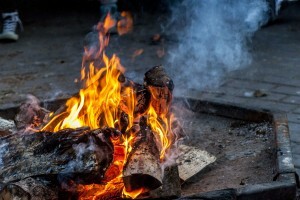 If this autoimmune disease can be healed naturally (the fire extinguished), then there is a greater possibility that this healing will prevent future autoimmune diseases from developing (the smoke detector will not beep). What if you could choose something different? What if instead of these risky hyperthyroid symptoms and unappealing treatment options, you could choose to heal your immune system and body? I want to encourage you… You have the information and opportunity to make your story different and I would be honored to join you on this journey toward better health! Take the first step toward complete thyroid health and healing by scheduling an appointment today. To learn more about thyroid disease, check out Why Testing Only TSH Isn’t Enough, Why Over-Medicating Thyroid Disease Masks the Underlying Problem, and Non-Autoimmune Hypothyroidism. I have Graves disease and Hyperthyroidism.., HELP! This entry was posted in Autoimmune, Natural Medicine, Thyroid and tagged Autoimmune Thyroid Denver Colorado, Graves Disease Denver Colorado, Naturopath Thyroid Denver Colorado, Thyroid Disease Denver Colorado. Bookmark the permalink.